Every day holds promise and may shock you! I wake up early. I’m looking forward to touring Valley of the Gods today! Very little light is coming through the windows of the Best Little Trailer. (I sleep with the blinds up so we can wake to sunbeams.) Gee, it must be very early. Hmm . . . Spike and Bridget are still asleep. I lift myself on one elbow and peer out the window. “Oh, DRATS!” I groan. The sky is heavily overcast with menacing rain clouds that aren’t going anywhere else fast. Darn. I sink back under the covers as the first raindrops tap lightly on the BLT. This is going to be an all-day rain. After breakfast I go online and find the internet is very slow for no good reason. Great. Well, there’s always my kindle. I choose a book at random from the scores I’ve loaded. Something by Zane Grey. Turns out the book is about these white guys riding horses through Monument Valley with an Indian guide and they end up climbing down into Tsegi Canyon and the Betatakin village is there and . . . Isn’t that strange? Of all the books . . . Grey engages me for a while with his descriptive narrative that takes me back to our recent camp at Navajo National Monument. It’s mid-morning and still drizzling. If this doesn’t clear up by tomorrow morning, to heck with the Valley of the Gods. We’ll leave! I turn off the kindle and pull the covers over my head. Bridget gets under the covers with me. Spike already snores at my feet. Together we stage a protest nap. Around noon I peer out the window again and . . . wow! Well, dear reader, we pull ourselves together, grab a bite to eat, and with much excitement from the crew and quite a bit of anticipation from myself, we set off. Will the roads be bad after the rain? Will we get hung up in a dip in the road? Will I wish we had stayed in bed? I told you they were zigzagged! Now do you believe me? Valley of the Gods is a 17-mile loop. I decide to enter from the southeast. At the first curve in the road we approach a wash with water in it. Oh, no. Not good. Maybe we should go back. Just then a white SUV appears over the little hill opposite the wash, obviously having completed the tour. I watch the SUV slowly negotiate the wash.
As the SUV approaches I hail it to stop. A smiling couple sits inside. The man replies with a British accent. “The road is fine. That there (meaning the wash) is the worst of it. Beautiful drive. You won’t have any problem.” I thank them, the lady calls out, “Enjoy!” and they drive off. Let me tell you, did we ever enjoy! A dark and dismal morning evolved into a bright afternoon. What a place! The crew and I had such fun! The BLT waits for our return. NOTE: Later in the early evening an electrical storm appears on the horizon, moving toward us very quickly. I race outside and take down the antenna and stow it in the PTV. I hurry back inside, close up the laptop, and reach up to pull out the inverter plug from the 12 volt socket. It gives me an electrical shock. Thus I did not post yesterday. This morning the inverter (the big one I use to charge the computer) does not work. I’m typing this out in the PTV with the motor running. The PTV’s nose is to the back end of the BLT so the antenna wire will reach inside the PTV where I have the air card. My laptop is attached to my smaller inverter which is plugged into the dash. The laptop screen is flashing and the keys are acting funny. Here we are in The Middle of Nowhere and I need a new inverter. I can’t post the photos of Valley of the Gods right now, and I may be thrown offline for a while. I’ll post pics as soon as I can. Carry on without me! This entry was posted in Simple living and tagged Goosenecks, inverter, National Monument, Navajo, RVing, simple living, Southwest, Travel, Utah, Valley of the Gods, Zane Grey. Bookmark the permalink. 99 Responses to Every day holds promise and may shock you! So happy you got to do the drive!! Fabulous!! But sorry to hear about your inverter. How is it these things always happen when you’re furthest away from any possible means to fix them? I don’t know if your inverter is anything like ours, but there is a re-set switch (actually 2 on ours) that you can press on the inverter itself to see if that does the job. Short answers today. No reset switch. 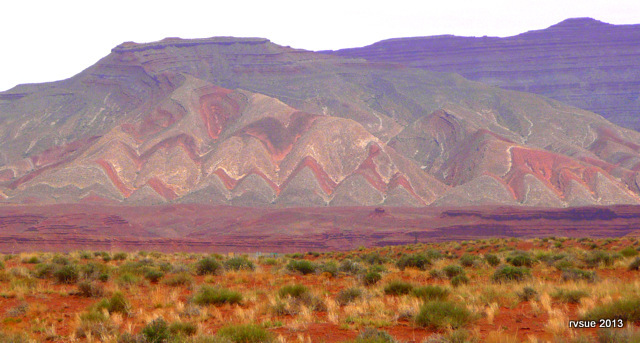 Zigzag mountains are our backyard view at Goosenecks. Glad you like pics. I wonder if the inverter has a fuse or reset button you may not know about? I hope the storm didn’t effect the computer module controller on your van though. As for the purple mountain…a dear friend of mine passed away a couple of days ago. Her favorite color is purple. Her favorite landscape was the desert upon the mountains. I think she is enveloping the world in purple 🙂 may I borrow the photo? Chuck! Have you left TorC yet? If not, can you pick me up a 400 W inverter in town? Don’t worry about getting a good deal. I need an inverter! New inverter headed your way, be there Friday. Sorry folks….. that’s as speedy as we can get !!!! Haha! I’ll limp along with this little inverter until you get here, Chuck! Are you sure that what you felt wasn’t just a static shock? Dry climates will do that. Also, have you checked for a reset button or fuse on the inverter, so see if something tripped? Some of the better inverters have a ground fault built into them, so check for any reset buttons. Do the lights on the inverter come on? If not, it may be a fuse that supplies power to the inverter. I’m surprised that you had to go to the van to use your other inverter. Don’t you have a 12 volt socket in the Casita somewhere? If that isn’t working, then chances are you have blown a fuse, and there may be nothing wrong with the inverter at all. Just think logically and work your way backward in any troubleshooting, starting with why the inverter doesn’t work. If it doesn’t have power to it, then why not? Is there power where it gets its power? If not, then check farther back, to what supplies power to that circuit (logically the fuse/breaker first). If there’s power into the inverter, then what’s keeping it from coming out… maybe something tripped? Try removing power from it and letting it set for a few minutes and then try it again. Some devices have a self-resetting feature built in, which will refresh after reapplying power to it. If none of that gets it working, then yes, you may actually have a bad inverter, but that is not the mostly likely reason for it not working. Make sure you exhaust all other possibilities before possibly wasting money on a new one. And please, let me know if you have any questions. I’m here all day. Nice to hear from you! Inverter has power. Its lights come on, screen shows 000 then goes to 888 (which is normal), then nothing. Went to PTV to get post done, rather than fool with 12 volt plug in BLT that may have been damaged. One wire on inverter is slightly shredded (loose copper “hairs”). Put it back together as best I could. Hope resetting (waiting) feature clicks in. No reset feature. Will take inverter apart for more clues. Thanks so much, John. You seem to appear whenever I need help! If it has lights, then there’s definitely power to it and nothing wrong with any socket where it plugs in. Normally, they will have some kind of fuse or circuit breaker button (reset) on the ouside where you can see it. Some of them use the flat automative type fuses that plug in and are color coded as to current rating. If you find nothing on the outside that can be reset, then it may truly be an internal problem… maybe repairable and maybe not. The larger ones can be worth repairing due to cost, but sometimes the smaller ones aren’t worth it if you have to pay someone else to do it. If you can mention the brand and model number, I’ll research it for you and might be able to walk you through any troubleshooting to save you some money. Also, do you have some way to check for voltage, like a small meter or at least test light? That would be all you need. John… This is a cheapie… less than $50. Read manual. Nothing on outside to fix. Internal. Cannot open it up anyway, built to discourage customer repair, recessed screws started to strip when I tried. Not worth paying for repair. Thank you, John! I agree. Better (and easier) to just replace it when you get to town. It’s good that you have a second one for these kinds of emergencies! Well, the two pictures you did post were awesome. The BLT sure looks tiny against all those millions of years of rock formation. Wow, how did you figure out all that tekkie stuff. You are a genius for sure. Guess its also a matter of having to do it if you want to communicate with the outside world. Can hardly wait for your next download. Hi Pat! Glad you liked pics. No, not a techie. Mick is laughing. Mick not laughing, if those copper wire strands are what you touched to get the shock you should tape them up NOW. 120 volts AC is very dangerous. The daughter of an electrician knows that! Oh My… stunning photo. Thank you Sue and Crew for sharing all the wonderful and beautiful places you go. Not sure if I did good or not… but I ordered the RV setup from Wilson Amplifiers to boost the cell services when we set out on Gary’s Road Trip. I don’t want to be without cell service “just in case” we need emergency medical services. Hopefully, this fancy dancy system will work. We will have three of the major four carriers covered so I will be keeping a good record of which carrier works best with and without the Antenna system. The VOG is on Gary’s Bucket list, but I think I will have to Suburban us in and out of the area because the RV and Suburban is over 60 feet long. It’s going to be interesting just where we can and cannot go/get into. I NOW understand why you planned a long time… my goodness I have been planning and getting ready since the day the doctor gave the clearence in December and I am still not ready! I had always hoped for this time to come, but never expected it given all the circumstances. God works wonders in ways we sometimes don’t realize. Spikey, I am so looking forward to reading about your take on the last couple of months. Hopefully, the inverter issues are something really simply, easy and FREE! PS… We learned from the neighbor gal yesterday, she was “asking Rowdy to bring her a trash bag” tis the reason he unrolled the whole roll. Grrrr…. (nice neighbor gal but my gosh, encouraging bad behaviors) Could it be… Rowdy isn’t so bad after all and that it’s just human influences? I would also be very much interested in what works. We are going to be full-timing in the near future and have been watching to see what others are using. Do you have a blog that you will posting to? If not, please let me know how we can get that information. If you don’t want to post anything publicly, just click on my name and go to my site, and leave me a comment. I’ll be able to read it, but won’t let it show online. Yes, John, there will be a blog/website. I have been withholding it until the company has it completed and live. I will certainly share the web address with Sue’s permission. I am excited about this system, I just hope it works! When you do comments on the blog, just fill in all three boxes at the bottom and your name will become the link to your blog… when you’re ready. Hi Kay… Always enjoy the latest episode of The Adventures of Rowdy! Oh boy what a great Blog name! Maybe I should put thought into this. Kay…. To see Valley of the Gods… camp at Goosenecks, leave your RV, and drive the short distance over to VOG. From someone who has done VOG both ways: DO NOT take your trailer or motorhome into VOG. Saw a couple of europeans who probably didn’t understand the sign that WARNS no RVS or ignored it and they made but they were in RENTALS. Both got tore up and each was going in a differant way!!!! First time we did north to south in our F450 4door duallie. Went VERY slow, VERY, VERY slow. 2nd time south to north in Geris TrailBlazer, much nicer. Chuck…. The road has been improved. It’s been scraped and the dips are not as severe. They took down the sign. But you’re right — It still wouldn’t be a good idea to take an RV in there. Sharp curves, road becomes narrow on steep hills. Totally agree w/ RV Sue. With the improved road I’d take a smaller trailer or truck camper in, but not anything bigger. We did see a couple of small guys in when we did our drive-through last month. No way we would take our big RV in there. Fabulous pictures Sue. Sorry about your inverter troubles. Hope the fix is easy and not toooo expensive. I was looking for the link you used to have up there for Mick’s detailed for better internet info but don’t see it now. Did it get lost?? It’s there. “Internet Antenna” – If you want the Wilson antenna, make sure you have an air card that allows for an adapter cord before purchasing. I love your posts, you are my link to the world as I sit here in Portland. It’s beautiful here but I miss being on the road by myself, I wanted a partner but the solitude was more important than I knew. Well, Rik . . . I married twice and divorced twice before I realized I’m too much of a loner to live with another person. Hey, live and learn, right? It always makes me smile when I read that someone loves my posts. Thanks for letting me know. I just spoke with Chuck while he was in the Wal-Mart in Truth or Consequences, NM. He and his wife, Geri (comments as earthdancerimages and writes HappyTrails blog) are meeting me on Friday in Bluff. We’ve been planning to meet for several weeks. Ain’t technology frustrating . . . and grand! Whooo Hooooo!!! Awesome news!! And triple awesome that Chuck & Geri are helping out. The Zig Zag is remarkable! So sorry for your problems. It is so good that some of your readers are talented and helpful! You are blessed. I am, indeed, very blessed, Nan. It amazes me how my readers respond! First picture looks like one of those craft projects with colored layered sand in a jar . You’re right! I knew it was familiar. The photographs are breathtaking–the light and conditions must have been just perfect! The zigzag mountains belong on a postcard–foreground and all. I think if Spike ever starts talking, he’s liable to do some tall tattling about all the dangers he has to guard his family against: mean heifers and bulls, psychopathic woodpeckers, scary electrical stuff, and unruly tourists to name a few! I’m happy you like the pics. I know Spike considers his job of protecting us is very important. Hi Sue, I was wondering, Is it safe to unhook the trailer and sitesee. Do you do that often. I have wanted to unhook mine from time to time but I never felt safe enough to do that. I always figured it would be gone when I get back. Thanks for all the great pictures. I decided from the get-go that I would unhook and leave it behind. That’s the whole point of having a trailer, so you don’t have to lug your home around with you. Usually I don’t give it much thought. 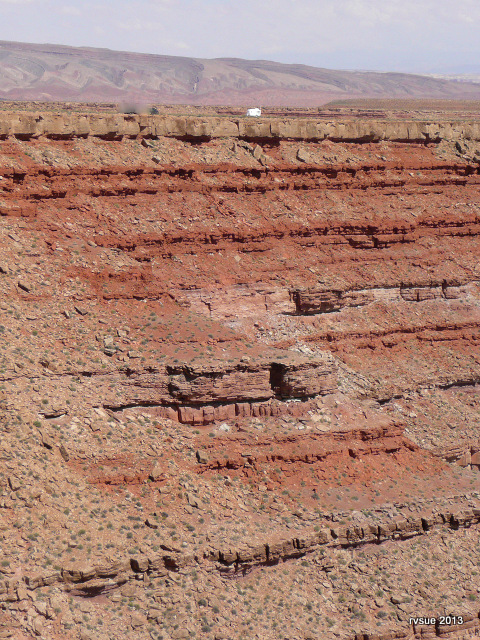 I admit I had an anxious moment as we returned to Goosenecks, right before the BLT came into view and I took that photo. It’s so very isolated and empty here. I rationalized that someone would have to drive all the way out here with a truck with a hitch and tools to saw through the hitchlock in order to steal the BLT. People who come here have tourist stuff on their mind or are camping and have a rig already. Time will tell. I hope I don’t find myself posting bad news from a motel room someday. I think thats a great attitude Sue, I may follow your lead, after all It`s just stuff. Awesome photos! I’m green with envy! you out did yourself today with the picures…love that zigzag mt. picture!! you’re going to get me out there yet. Come on out, Ron. There’s plenty of room! Purple mountain majesty, of course. We’ll wave as we pass by in a couple of weeks. Off on a 6,000 mile clockwise loop of the country in a couple of weeks. Wow! That’s ambitious! I hope you’ll be able to take your time and enjoy. Congrats on 1000 followers. RVsue & Crew is the BEST!!! Thanks, Mick. I knew you’d notice! Wow! Love Zig Zag Mt. Can’t wait to see VofGs in your next blog and see what Spike has to say…LOL! Oh dear, gotta’ wake Spike up and put him to work! The ZigZag photo is awesome. Hope I can be where you are someday soon. I hope you can be here, too, Barbara. Sorry to hear of your inverter problems, but it’s so cool that one of your readers/friends is able to bring you a new one! I’m constantly amazed at the connections we make electronically! These two photos are beautiful. The one of ZigZag Mountain almost looks like it’s been Photoshopped, but I know you wouldn’t do that. My fear of heights made me gasp when I saw the BLT on the edge of that sharp cliff. I hope it’s not as close as it looks! The photo of ZigZag Mountain was zoomed and I increased the saturation to make the photo match how the mountains look to the eye. I avoid “enhancing” photos so that the subjects are more vivid than real life. When it’s a hazy afternoon and the vegetation looks washed out to the eye, that’s how I leave the photo. In this case, the mountains were more vivid in reality than in the photo, so I saturated the color. That picture is so amazing, I can’t even believe what it looks like in person with all those colors. I’ve added this place to my wish list. Have a great visit in the area Sue! I managed to photograph the mountains when they were wet and the light was favorable. Glad you like it, Tina. If you have a 12 volt outlet in the camper, why even bother with the inverter? The inverter is taking 12 volts up to 110 and then your laptop cord is taking it back down to around 10-20 volts, and you lose a small percentage of power in the process. You should be able to find an inexpensive car charger for your laptop. I have solar on my van and my HP laptop hasn’t been plugged into anything but a 12 volt socket for almost a year. Well, David… Then why did the professional solar people set one up for me? I’m confused. Your logic makes sense, but these people do countless solar installations in RVs. The solar charges your 12-volt battery systems and really has very little to do with inverters, which convert that voltage to 120-volts. If you had all 12-volt appliances, you wouldn’t need the inverters. But the inverters are handy for some things like coffeemakers, shavers, and other electronics that haven’t (yet) been replaced by 12 volt counterparts, but that’s ALL they are for. He is right, in that you could use a car adaptor for your computer and not worry about using an inverter with it. All the inverter does is provide 120-volt power that is only converted by that “box” in your computer cord back to 12-volt DC again! If you look at the spec plate on the back of your computer, you will see that the input is most likely 12-volt at a certain current rating. As long as use a car adapter with that same exact voltage, and “at least” the same current rating, you will be fine. The adapter cords are great for working at home, but are totally unnecessary in a vehicle that already has 12-volts! Just be careful with other battery operated electronics, though, as some of them may require less than 12-volts, such as if they only have a few AA batteries in them. There are universal adapters available at places like Radio Shack that you can set the output voltage to whatever you need and will also have all the right plugs with them. Typically, for any electrical device, there is a different plug for every change in current or voltage, so make sure you use the right one. You can always use a supply that provides a higher current rating, but NEVER use a higher voltage than the device calls for! I hope this explains it better. If you have any questions, I’m here every day. John is right. The inverter is there for devices that don’t have a 12 volt option. If you have the 12 volt option, it is more efficient. Just be sure that you buy the right car charger for your computer. Amazon and Best Buy are both good at matching your needs. (For example my laptop uses about 19 volts. The 12 volt cord “bumps it up” to that level. Not a problem, but it wouldn’t work properly with a straight twelve volt adapter.) When I set out on my adventure, I made sure I had 12 volt adapters for my phone, portable radio, etc. The only time I use my small inverter is for my hair clippers and my blood pressure monitor. I bought an expensive big pure sine-wave inverter and I’ve never used it. Thanks to Geri and Chuck for saving Sue a trip to get a inverter. I would hate to see us do without our armchair adventures. As to leaving the trailer alone, I used to do it with mine but not overnight or for real long times. I had a little portable radio and I used to leave it on so you could just hear it outside if you were nearby. My theory was even if someone knocked they might think I was napping and didn’t hear them due to the radio. Beautiful pics Sue. Be safe…. Hi, Jim . . . .I wouldn’t leave the BLT alone overnight either. It’d have to be an emergency situation. Glad you like the photos. Oh! One other thing. I also used a hitch lock so you had to be able to cut it off in order to hook up my rig unless you had my key. Yes, a hitch lock is the first line of defense! No reset button on this model. going rv boondocking, Tue Mar 5th 2013, was the blog about “resetting” the inverter. I think they had to remove all input and output connections to get it going. And good luck again. Thanks, Mark. That’s a project for a rainy day. Oh, it IS raining. What is the name of the Zane Grey book? I have gotten a few off Project Guttenberg where there are thousands of free books in every format for all readers. Hi Stan . . . Tales of Lonely Trails. I’m enjoying the descriptions of the desert and forests of Utah and Arizona, but the hunting episodes are definitely from another time… His hunting party is killing cougars and bears wantonly. I’m fascinated by Zane Grey the person. He can be so masterful and poetic with language, enchanting me with great descriptive passages about the beauty of landscape and wildlife, and then he takes part in brutal treatment of wild animals! I found your blog on the Casita Club Forum, as we just bought a 2013 Casita Spirit 17. I am also a retired teacher (middle school social studies) from Georgia (actually from NC, but taught for 23 of my 30.5 years in Georgia). We now live in Minnesota and winter in Gulf Shores, AL. I love your blog! I have gone back and started at the beginning and I am trying to catch up and read the new posts, too. I have read the first year so far. We have a large 5th wheel that we live in during the winter in Gulf Shores and bought the Casita for summer travels. We have only stayed in it one night so far and that was on our way home to Minnesota last week. We thought we had waited long enough for winter to be over, but we got stuck in the Walmart parking lot in Rochester, MN only 60 miles from our house in 15.5 inches of snow. The road was closed and they didn’t even plow the parking lot until late afternoon. This is in May! Our “Iggy House” held up great in the snow and cold. We travel with 4 Italian Greyhounds (all rescues) so it should be interesting on the road this summer as we have several trips planned. I love reading about the “Adventures of Spike & Bridget” as I can relate. Our dogs love to travel, but the male goes into panic mode when we slow down or stop. Since they are all rescues, we don’t know about his life before us. He is a little better now, but still starts this terrible crying noise when the tow vehicle slows down for a stop. After that long introduction, my question for you is about your Wilson antenna. Can you use it without a MiFi card to just pick up free WiFI that is just out of your range? Thanks, and I look forward to reading about your adventures in the future. Hello, IGMom and welcome to by blog! I’m glad you found me and the crew. Thank you for going back to read from the beginning. You see why I’m so thrilled and grateful for this vagabonding way of life when you read the early days of this blog. I wonder about your panicky male dog. Maybe he was dumped. People can be so cruel. Italian Greyhounds are wonderful dogs. To answer your question… I’ve never been in a situation where I wanted to increase signal to pick up free WiFi. I don’t see how it would work to pick up Wifi without a card. The antenna would have to connect directly to the laptop (or whatever)… I don’t really know. I have a hard enough time understanding what I have that works, than trying to explain other situations. 🙂 When I’ve used free WiFi, I was near the signal and I don’t think I used an air card (long time ago). Every Casita needs to have a snow adventure. The BLT has had a few! Hi IggyMom! Chuck and I had to laugh at your post. When we first started camping together, we camped with 3 dogs and a cat! LOL! The cat got huffy and left so the next summer we went workamping in NM from FL with 3 dogs. After a year of that, we were still together , hadn’t killed each other or the dogs, so we decided to get married! We love the name “Iggy House”! I should have mentioned that we started in a Casita also! And IGMom lives in a big fifth-wheel, too! I often find that without realizing it ahead of time, I pick up books that have something to do with what is going on in my life at the time or something I need to know more about. Coincidence – I think not 🙂 It can be quite a pleasant surprise. The picture of the zigzag mountains is quite spectacular. Oh, the places you’ve been! I’m sorry to miss posting the photos of Valley of the Gods today. I’m still having problems. My computer keeps giving me the message that I need to replace the battery. I take the battery out and put it back in. This enables me to boot up but everything is so slow and I can’t get the photos to upload. I’m at a new camp with weaker signal. Tomorrow I’ll go to Bluff and see if I can post there. I’ve read all the comments. I want to reply individually to all but I’d better not press my luck. Thanks for the technical help, David and John. Our new camp is primo, BTW! Finally we’re camped next to water! Oh Spikey will be having a good time!!!! Sue, you should be able to order a replacement battery for your computer from Amazon at a decent price — if that really is the problem. I just replaced the battery in mine. I doubt if it’s your battery, if it was working fine before. It sounds to me like your other inverter may not be sized right for it, or else you may have a poor connection (maybe in the plug) that’s causing it to get low voltage. 12 volt sockets are notorius for poor connections. You should be able to tell on your task bar whether your computer is running on its own battery or on other power. A low battery won’t make any difference if you have other power coming into it. Look at the power supply (in the cord) of your computer and see how many AC watts it takes, and make sure your inverter has at least that capacity in watts. Your computer nameplate will be different. If the nameplate on the computer is in amps, mulltiply that by the voltage to get watts, but remember, that’s on the DC input. For instance, mine says 19 volts at 3.42 amps. That rounds out to 65 watts if I were feeding it straight DC. But the power supply adapter (in the cord) that came with the computer says 120 volts AC and 1.5 amps for the AC input side of it, and that equates to 180 watts AC that the power supply needs! So if I were using an inverter in a vehicle with it, I would have to have “at least” a 180 watt inverter, or larger. That tells me that the power supply alone is wasting 115 watts just to convert that AC to DC, which is why you should order the correct vehicle cord for it and use DC straight from your vehicles. Your batteries will thank you for it. Love the colors of that zigzag mountain. Wanted to use it for a background on my computer, but it wasn’t big enough and tiled instead. There might be a way around that but I don’t know how. Looking forward to seeing more pics when you get things up and running well again. When I got to the Zig Zag Picture it was a big WOW. I had never heard of them. You are an encouragement to my own full-time dream whenever my spirits lag! Thank you for sharing so many places. DUH! SUE not SE !! !